The directions for this route are very straightforward. Simply start in Lewiston, Idaho on US Highway 12 and take it east all the way to Missoula, Montana (or in the reverse if you want to start in Montana). You'll basically be cutting across the entire width of Idaho. This route covers one of the most beautiful sections of the Lewis & Clark Trail as it winds through the Rocky Mountains of Idaho and Montana. As you ride through the Lolo national forest, look for whitewater rafts on the Locsha and Selway rivers. You'll also see numerous steaming hot springs flowing down the hills along the way. Watch out for deer and mountain goats crossing the highway at random intervals. You have all seen the photos of the sign that says "Curves next 67 miles...This is the road! One of the best motorcycle roads in the country with lots of sweeping curves and a few tight ones. There is little traffic and excellent road surfaces. A rock solid 5 ... 5 plus is more like it! Sorry... The same sign that says Curves ahead says no services next 75 miles. Make sure you fill up in Kooskia or in Lolo before entering this highway because there's nothing but trees, rivers and twisty roads for lots of miles! At the eastern end of the road, try KT's Hayloft in Lolo, MT (Intersection of Hwy 12 and Hwy 93) for breakfast! on December 28, 2014 8 out of 8 members found this review useful. After 5 years of yearly road trips I can still say this is my ultimate favorite road, especially if you can do it without having to deal with an 18 wheeler. It trumps Beartooth Pass and The Million Dollar Hwy because of its 45-50 mph / multiple curves. Once you get in your groove, you will be in heaven. Watch for wild life and enjoy the Clearwater River! on September 1, 2014 5 out of 5 members found this review useful. Very accurate description of the Hwy. 12 ride. I've ridden it twice now. The "No Seervices for 75 miles" reference is TRUE, except that there is AT LEAST ONE gas stop (that I'm aware of) on that route. Lochsa Lodge, 43 miles west of Lolo at Powell, has GAS, a FANTASTIC restaurant, a small convenience store and lodging, albeit a bit expensive. That's all I wanted to add. GREAT RIDE though!! on June 20, 2010 5 out of 6 members found this review useful. The road teases you, starting with gentle sweeping turn, building you confidence and urging you faster. The scenery, the curves, and good road surface continue relentlessly. As your endurance wanes some turns have closing a radius. I had the time of my life riding Lolo pass. A stop at Lodge near the top of the pass is great to a quick bite and fuel before heading back down. Everybody rider should have the joy of riding Lolo pass at least once in their life. Go early in the day before the revenuers (law enforcement) give you a performance award. on May 9, 2014 3 out of 5 members found this review useful. This is one adrenaline pumping ride! Most of the curves can be taken 20 mph over the recommended speed, and that on a touring bike! The road follows the river the entire route, making it not only an exciting ride, but scenic as well. A must ride for anyone who likes to combine thrills and beauty. on November 5, 2012 3 out of 3 members found this review useful. I found the Lolo Pass quite by accident last july. Heading for southern Idaho where I used to ski in the late 70's. Decided to head east instead. Tremendous ride until I got past the sign that says, curves for 99 miles. Yahoo? Only until I came across 2,(two) westbound wide (really wide)loads, with a whack of pilot vehicles. As soon as a straight stretch showed up the loads took up the whole road, thanks to the aforementioned pilot vehicles.It took about 30 miles to get past them peckerheads. What normaly would have been a glorious ride, in really hot weather, turned out to be an excercise in frustration. Not the road's fault by any means. A recommeded ride at any other time for sure. Paul Bond. on November 3, 2011 3 out of 3 members found this review useful. Rode LoLo in August 2010, as part of a 23 day 8,000 mile ride covering every state West of Louisiana. LoLo Pass was a high point of the ride. on February 5, 2009 3 out of 3 members found this review useful. Amazing ride! watch out for the trucks, we have seen a role over every year we have traveled this route. on February 21, 2015 2 out of 2 members found this review useful. Our all time favorite. My wife and my favorite ride. We have ridden this route 5 times in the last 12 years and always make it a point to ride if we are anywhere in the region. 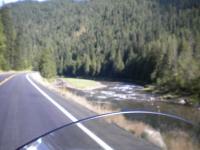 Beautiful scenery, great sweeping curves, some tight curve and a river beside you. Just can's be more fun. The "curvy" road sign, when coming from the west says it all. The first time we rode this route we stopped at the visitor center at Lolo Pass and my wife wanted to turn around and go right back to Lewiston so we could do it again. We will ride it again...and again. on August 26, 2010 2 out of 3 members found this review useful. A must ride. We rode from MT into ID midweek with very little traffic. What a ride. This was during a 2,000 mile week long ride and this was our favorite section of the week. If you enjoy big sweeping curves on perfect road surface along a very scenic wild river for miles and miles, then this is for you. Lowell is a great place to stop near west end. Good food, gas and choices to camp or rent a cabin across the road. Very little straight sections on this road. You can really get into a groove. Cant wait to go back. on November 7, 2016 1 out of 1 members found this review useful. I believe this ride is actually underrated here on this site. It is possibly my all-time favorite road. It has almost no side roads joining it, no overpasses for 100 miles. The scenery is unbelievably beautiful especially the stretch along the Clearwater River from Kooskia to the ID/MT border at the top of the pass and the road has plenty of twisties and sweepers to be enjoyed by all riders. I just experienced this wonderfully, winding and beautiful route the second week of August, 2016. I live in Western NC and ride the BRP, Cherohala , dragon, moonshiner and all the other local roads all the time. Lolo Pass, however, in my opinion, passes them all for continuous curves, beauty, distance, quality of road and overall riding quality. I rode east to west, then turned around and rode back to Lolo Hot Springs, MT. This is a must ride by any serious rider. on April 23, 2014 1 out of 2 members found this review useful. I headed in from Missoula, but could only go halfway because of the forest fires. Visibility was poor, but what I did see was beautiful. A nice park ranger told me it may be dangerous to go any farther, so I headed for Canada. I rode through a beautiful pass before Lolo on The Friendship reservation, but can't remember exactly where it was. It was really beautiful, though. on September 26, 2013 1 out of 1 members found this review useful. Rode this route on my way back to Seattle from Yellowstone a few years ago. Great scenery and wonderful curves. on September 23, 2013 1 out of 1 members found this review useful. Did this ride 3 times this year, East to West end of June and both directions mid September. Truly a great ride. Little black on the east end after the fires but does not affect the ride. on September 1, 2010 1 out of 1 members found this review useful. This was by far the best ride on our way back from Sturgis. From Missoula to Lewiston. We stopped by the river at some park and had lunch. on August 31, 2009 1 out of 1 members found this review useful. One of the best! All the way from Lolo to Lewiston or Grangeville. The highway construction get a bit, but that keeps the road in good shape. You can get gas at Lowell . on August 28, 2009 1 out of 1 members found this review useful. A beautiful day for this particular ride. There were delays but overall ...it is well worth it. on May 27, 2009 1 out of 1 members found this review useful. May 2009, 23 miles of road construction east from Lowell with gravel humps, and no warning of end of pavement in the east bound lane. Theres tons of traffic from river rafters and this year a new and exciting obstacle, Canadian attack geese that like motorcycles. Every year Hwy 12 is a majestic and surprising ride that will surely get your adrenalin going one way or the other. I highly recommend this ride! on July 7, 2017 0 out of 0 members found this review useful. This is on my annual list of rides! Where else can you see DOT roadside signs that say "Winding Road Next 99 Miles"!?! Not only will you enjoy carving these mountains with your motorcycle, but the views are tremendous! I've seen wildlife and I always enjoy the river and mountain views. Every little town I pass through, whether it's Orofino, Kooskia, or Lolo, is extremely welcoming to motorcyclists and I've found excellent food at every stop! If you're riding on a particularly hot day, be sure to stop basically anywhere to slip down to the river and dip your feet in the crystal clear mountain water! DON'T forget your camera or GoPro! on July 29, 2016 0 out of 1 members found this review useful. This ride is awesome and why it took so long to do it is beyond me. We had been planning this since Easter and actually pulled it off. We started off planning with five and ended up with five doing the ride. We live in SW Idaho and made this a two day ride but after getting into Montana we realized our mistake we needed another day to do some riding in that area it really is Gods country. We didn't have a real plan just a direction and a couple of days, my wife said "free spirits", that was code for something else I won't repeat. Anyway if you get the chance do it, great ride, awesome country, and super people along the way. We spent the night at LoLo Hot Springs camp ground, bar and grill across the street, the hot springs are open pretty late and they have showers at the camp ground. Motorcycle friendly, wake up and hit the road and see some wild life. Do it now not later. We did this part of our trip in early May 2016. Just like the other comments this ride is beautiful. The road surface is a 9 out of 10, the scenery is 10/10, the ride is a 10 as well. Hardly any traffic to speak of. We stopped at a roadside turnout for about 15 minutes and never saw a vehicle drive by. The river in early May is moving very quickly and looks awesome. Definitely don't pass it by if you have the opportunity to ride it. on August 1, 2014 0 out of 2 members found this review useful. Easily one of the best rides. Love the curves on this route. There are a lot of variations that one can add toe this route such as heading north out of Missoula for some awesome mountain views, or heading south down to Idaho (Salmon, Stanley, Garden Valley)or south in Idaho (to Whitebird Pass, Riggins, McCall). on February 20, 2013 0 out of 1 members found this review useful. Took this ride from Missoula to Boise almost 30 years ago. At that time, the sign at the Idaho border only said curves for next 76 miles. The best ride I have ever taken. The curves are sweeping, the river is beautiful. Just a fantastic ride. I am going to do it one more time this coming May from Salem OR to Missoula and back. It's a different ride going both ways from what they tell me. It's on my bucket list. on February 11, 2011 0 out of 2 members found this review useful. I'm lucky enough to live in Missoula Montana, which is just 10 miles from the head of Hwy 12. I can't think of a better sportbike road to ride on anywhere within 500 miles of here. If you're looking for a road with never-ending twisty's, straightaways, scenery, everything desirable in a motorcycle centered highway...this is the road for you. Definitely a "must ride" highway to ride on if you're near by on a motorcycle. on August 22, 2010 0 out of 5 members found this review useful. 67 miles of switchbacks with 100 degree temps gets old really fast,I dont mind curves,it got very tedious after awhile,believe me I am no novice,I wouldnt do it again in hot weather! on February 5, 2010 0 out of 3 members found this review useful. Aug 2008 over the going to the sun hwy pass flathead lake (breath taking) through lolo pass to lewiston ID, stop in at the loscha lodge (stay there if possible a slice of heaven). Not to be missed, one of my favorite places. on December 25, 2009 0 out of 1 members found this review useful. Rode this in 08 the weather was great, temp 90 degrees. The views are great and the pavement was good, the only down side is no gas along the way. I would ride it again. on July 3, 2009 0 out of 1 members found this review useful. June 2009, despite construction near Lowell, and light rain when I went through there, it's still a magnificent road. Good pavement, excellent scenery, well marked curves. Good lunch at the Loscha Lodge just West of the summit, it's off the road a bit so watch for the sign.